Gigi's Thimble: CONTEST ENDS TODAY! Leave me a comment (under this post or HERE) by midnight tonight to enter to win some fabric! *Leave one comment with a link to your posted pictures for each quilt label you've made. 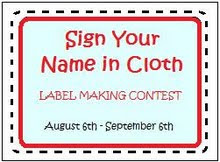 *Labels had to be made sometime between August 6th, 2009 and today. I'll pick the winner tomorrow. Good luck! Me too. Just bad timing for me with summer ending - vacation - prepping for my preschool . . . Try again another time. Maybe in the winter when we're all cozied inside anyway, with nowhere to go. . . It's a great idea and motivator for a good thing!